CHICAGO (WLS) -- Chicago police have released surveillance images of a car linked to a deadly crash last month. 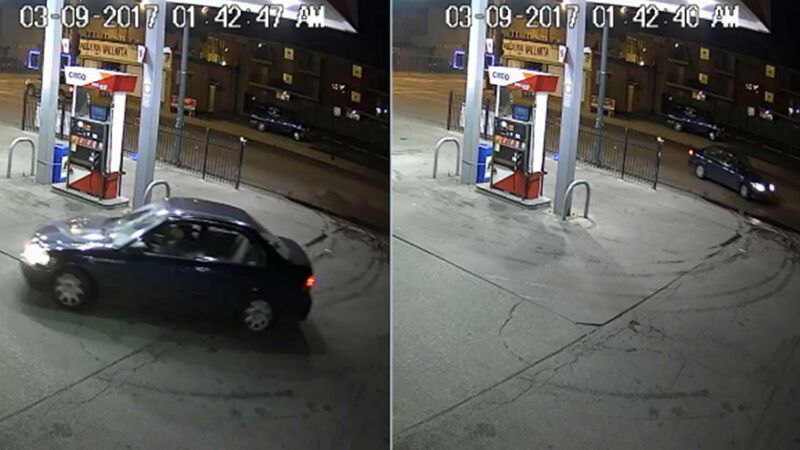 The photos show the car at a gas station located in the 2800-block of West 59th Street on March 9. Police said the driver of the car chased people in another car until it crashed in the 4400-block of West 59th Street at 1:44 a.m. A passenger in that car was killed and another hospitalized. The passenger, 21-year-old Tyshawn Pickett, was taken to Christ Medical Center in Oak Lawn, where he was pronounced dead at 5:07 a.m., according to police and the Cook County Medical Examiner's Office. He lived in the West Garfield Park neighborhood on the West Side. An autopsy last month found he died of multiple blunt force injuries he suffered in the crash. The driver, an 18-year-old man, was also taken to Christ Medical Center, where his condition was stabilized, police said at the time. Anyone with information is asked to contact the Chicago Police Major Accident Investigation Unit at 312-745-4521.